The Tech men’s tennis team had a rough Easter weekend last week, dropping matches to No. 12 Wake Forest and No. 34 N.C. State. A 5-2 Friday loss to Wake and a 6-1 Saturday loss to N.C. State dropped the Jackets to 11-8 overall and 3-5 in the ACC. The Demon Deacons opened the match by winning No. 1 and No. 2 doubles to take the doubles point, though Nathan Rakitt and Cole Fiegel won Tech’s No. 3 doubles match 8-3. Both doubles losses came in tiebreakers, with Christopher Eubanks/Michael Kay losing an 11-9 tiebreaker and Carlos Benito/Eduardo Segura losing theirs 8-6. 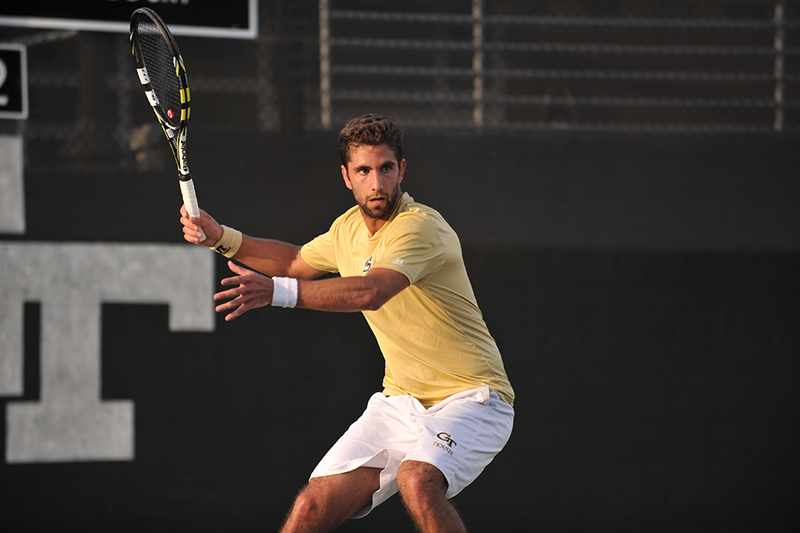 The singles matches did not start off well for Tech, with Wake’s defending junior Wimbledon champion Noah Rubin making quick work of Eubanks at No. 1 singles 6-2, 6-4 to put the Demon Deacons up 2-0. Segura was quick to respond though, as the senior dispatched his opponent 6-2, 6-2 at No. 6 to put the Jackets on the board. On the adjacent No. 5 court, Fiegel won 6-3, 7-6 (7-2) to tie the score up at 2 apiece. That was all the Jackets would end up scoring, however, as Benito, Rakitt and Kay would all suffer close, hard-fought defeats. The next day’s afternoon match against N.C. State saw Tech lose the doubles point again, this time losing at No. 2 and No. 3, with No. 1 pair Eubanks and Kay winning in a tiebreaker 8-7 (7-4). The singles matchups were no kinder to the Jackets, as Benito was the only winner at No. 2 singles. The Tech women’s team, on the other hand, steamrolled No. 34 Virginia Tech 7-0 on Friday, which was followed by a close 4-3 loss to another rival, No. 22 Clemson. The Lady Jackets, now 9-7 overall and 6-4 in conference play, came into Friday’s matchup on a hot streak of 3 straight wins over No. 32 Notre Dame, Wake Forest and No. 17 Duke. Tech took the doubles point with ease, using an 8-0 No. 1 doubles win from Kendal Woodard and Paige Hourigan and an 8-3 No. 2 doubles win from Johnnise Renaud and Rasheeda McAdoo to jump out to the early 1-0 lead. In singles, No. 1 Renaud took down her opponent 6-2, 6-2, while No. 2 Hourigan cruised to a 6-0, 6-4 victory. Woodard had a tighter match at No. 3, winning 6-4, 7-6 (7-3), but No. 4 Alexis Prokopuik won handily 6-1, 6-2. As No. 6 Alexa Anton-Ohlmeyer also won decisively 6-1, 6-1, all eyes were on No. 5 Megan Kurey to see if Tech could complete the shutout. After winning the first set in a tiebreaker, Kurey struggled in the second set to drop it 2-6. Kurey came storming back to take the third set tiebreaker 10-5 and the match 7-6 (7-1), 2-6, 1-0 (10-5). Kurey’s exciting victory gave the Jackets its 15th straight victory over Virginia Tech and its second 7-0 shutout victory in 8 days. The men’s team will hit the road this weekend to face off against Virginia and Virginia Tech before coming back home to finish off the season against North Carolina and Duke. The women’s team will finish off their home schedule with matches against Boston College and No. 12 Virginia, after which they travel to Pittsburgh and Syracuse to close out their season. Both teams will then travel to Cary, N.C., to compete in the ACC Championship from April 23 to April 26.